Advent candles come in a variety of standard sizes and in traditional Advent color combinations. These candles feature 51% beeswax, resistance to bending and dripping and are not affected by drafts. Made of only the finest natural beeswax—51% content guaranteed. 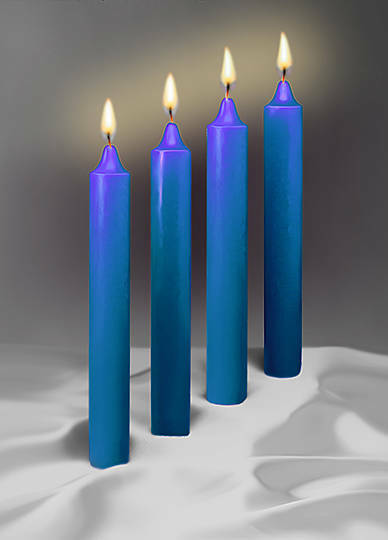 Clean, practically smokeless, and extra-long burning; set includes 4 Blue Candles, 12" x 1 1/2". Use followers to lengthen burn time and eliminate wax drippings; they are economical, safe, and clean. Contain wax drippings--use Clear Plastic Drip Protectors. Want to get rid of unwanted wax? Use “Wax Away” candle wax remover. Need Candlelighters/Extinguishers? Check out our selection here. Take a moment to look at our on-line selection of Advent Wreaths.